The 44408grt vessel listing in her stbd side in a complete dry dock and with massive stern ramp lowered, maybe the dock supports collapsed when the weight of the ramp caused her to lean onto the dock side. Note the steel props against her stbd side propping her against the dock side. In 43 years working at the dockyard .I have never seen anything like this. Hi IACSman, for sure from your information re the GRANDE ROMA, you are more knowledgeable than most of us re the workings of this and similar vessels.So do you have a hint of what might have happened here? Some mishap must have occurred ,but what?Your comments are very much awaited and appreciated. Ummm, not quite sure I follow you here guys. Perhaps I totally misunderstand you, but is there an opinion that these ramps can not be opened in drydock, because the ramp is "too heavy"? I have attended PCTS / PCC's / ro-ro container vessels in drydock,far bigger and heavier than this and lowered ramps without incident. That includes two Grimaldi vessels of same similar size as this one. Yes Federico, just as you said, sometimes superintendents/supervisors don't pay heed to the more experienced man on the job with negative results, I have seen this to happen (but in a less serious than the GRANDE ROMA incident).They often look down on the man on the actual job. Good morning Emmanuel, there is nothing to balance the list during the opening of the ramp. It's a very economic built ship. In normal loading conditions usually the list arrives to 4°. As soon as the ramp is on the quay the ship goes upright. 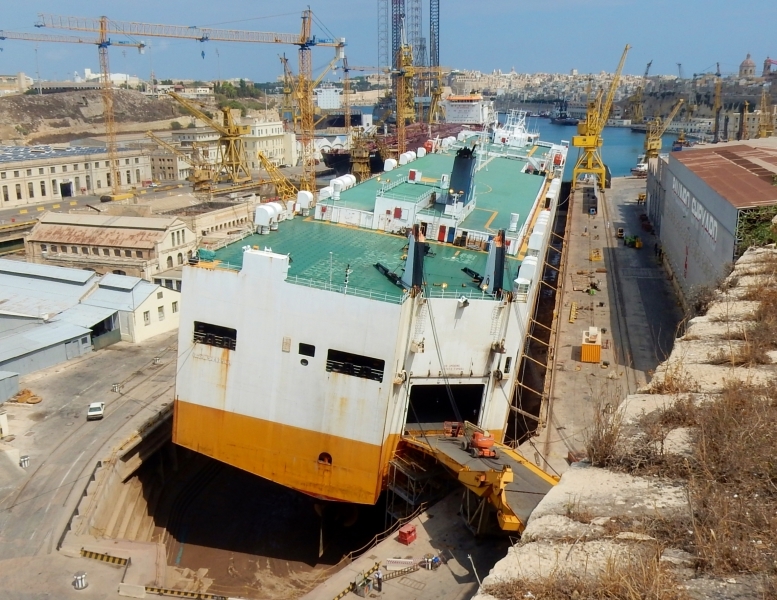 I remember that many years ago I was inside a floating dock somewhere in the Mediterranean and the superintendent asked me to open the ramp for general maintenance. I showed him how to operate the ramp and then I said to do himself while I was going ashore...and the ramp was much smaller of this, only 93 tons. Some times it is necessary to remain firm on some situations where superintendents or supervisors want to do something not safe or not possible. Federico, apart from the central line of bilge blocks. other blocks are spread further to the sides from the centre.Some sort of compensation she must have when the ramp is lowered whilst the ship is afloat,maybe ballast tanks etc. 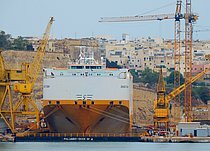 but remember she was high and dry in drydock and the ramp , quite massive and offset to stbd was lowered, thus causing an imbalance to stbd. since then the dock was refilled and the vessel righted up and the ramp raised up once again. No comments or info was published by the company or other authorities up till now. 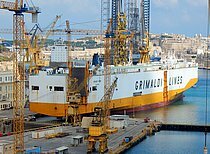 Re the GRANDE ROMA incident, the only tragic incident ,that I know of, was when a ship moved in dry dock (in Malta) was on 29 may 1947 when HMS WOLFE a destroyer depot ship moved forward whilst in No.4 dock , the bilge blocks toppled forward entrapping a worker a worker who was killed and 3 others injured. That was before the dock was enlarged in the 60s to enable large commercial vessels to dock when the RN dockyard was transferred to commercial interests. Well David ,the dock concrete steps permits wider ships to dock safely,I remember one bulker or tanker which had literally inches from the dock sides. This is not a warship but a flat bottomed vessel which is supposed to have adequate bottom supports, I still think that the lowering of the heavy ramp caused excessive weight on her stbd side thus causing this incident. Happily no injuries was reported. That class of ship has no autobalance heeling system. Shape of the hull is not the best to sit on drydock blocks. So, probably a misjudgement of the situation by the chief officer and captain. Nothing that has not been seen before. This could also be a miscalculated ballast condition, which worked fine while afloat, but not when hull is dry. To be a little "mean", Grimaldi vessels have listed far worse before. Anyone remember "Reppublica de Genova" in Antwerp? Have seen other car carriers in dock (Japan) with such list after a fire in the car decks, and they were not able to drain the fire hose water properly (clogged drain and valves). On the previous day, afloat, she looks off-centre and very close to the dock edge on the port side. Could she have settled on a concrete step? But perhaps that would be too fundamental an error for Palumbo. This photo has been shown 1,365 times since it was added to the site.